Graceland, Elvis Presley’s 23-room mansion and 14-acre estate in Memphis, Tennessee, was the singer’s sanctuary where he carefully guarded his privacy. He died in his beloved mansion at the age of 42 on 16 August 1977, apparently of a heart attack, and is buried there along with his parents and paternal grandmother. 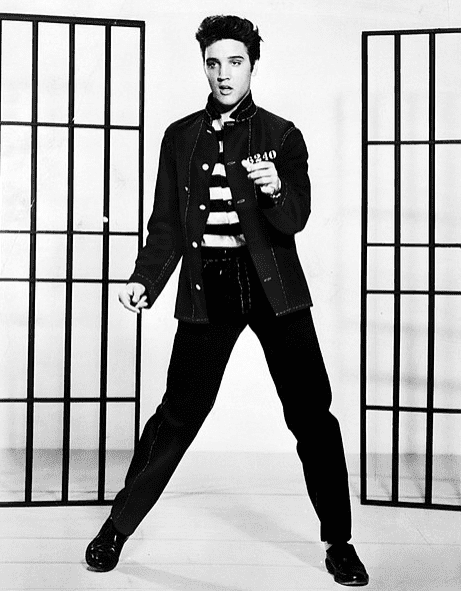 Photo: a publicity photograph of Elvis Presley promoting the film “Jailhouse Rock,” 1957. Credit: Metro-Goldwyn-Mayer, Inc.; Wikimedia Commons. Five years later, with the estate burdened with enormous upkeep costs and a large tax bill, Presley’s former wife Priscilla was facing the possibility of selling Graceland. Acting as the estate’s executor on behalf of their daughter Lisa Marie, Priscilla Presley decided to open Graceland to public tours – a decision that probably would have horrified Elvis but delighted his legions of fans. 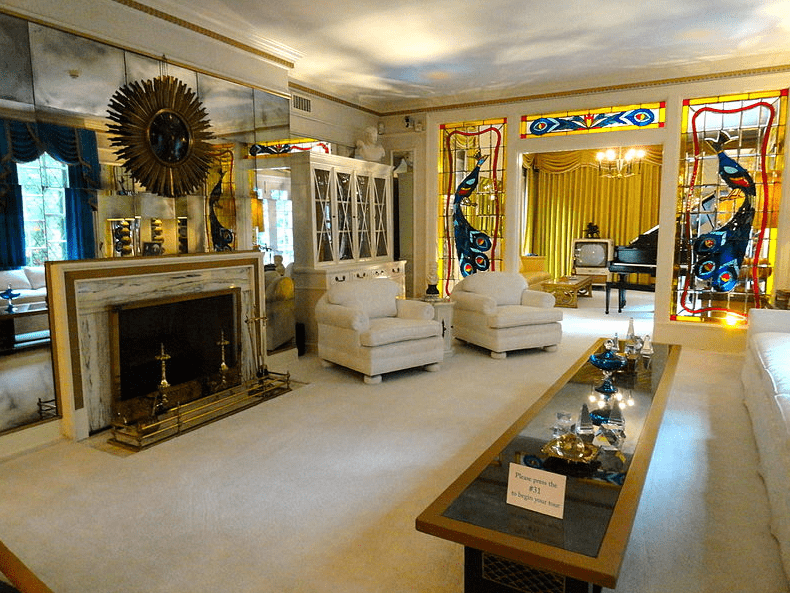 Photo: Graceland’s living room. Credit: Ronincmc; Wikimedia Commons. 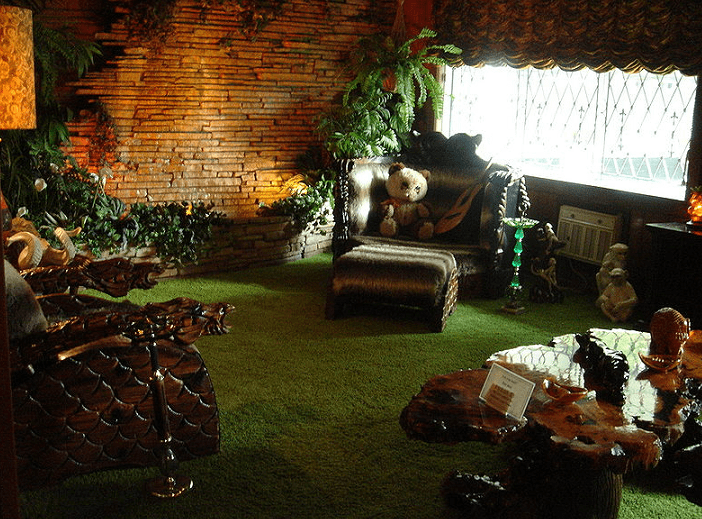 Photo: Graceland’s “jungle room.” Credit: Egghead06; Wikimedia Commons. 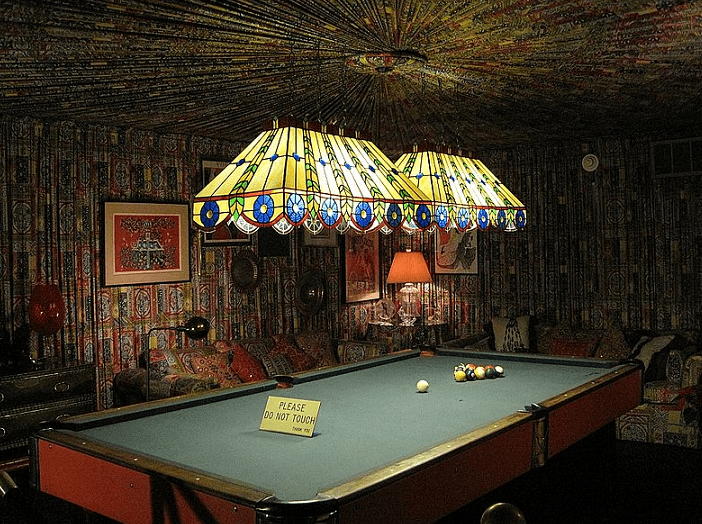 Photo: Graceland’s pool room. Credit: Thomas R Machnitzki; Wikimedia Commons. 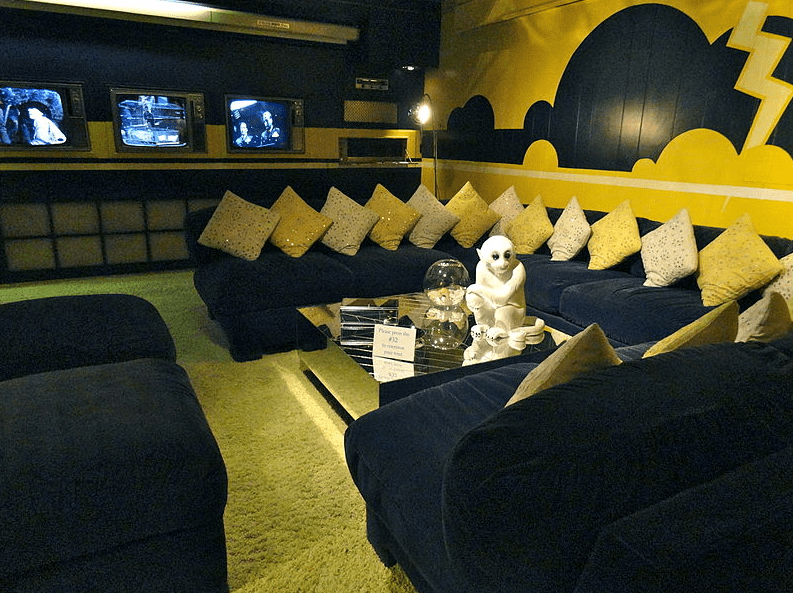 Photo: Graceland’s TV room. Credit: Ronincmc; Wikimedia Commons. The site has become a hugely successful tourist attraction, with over 650,000 visitors every year – second only to the White House as America’s most-visited home. On 7 November 1991, Graceland was listed in the National Register of Historic Places and became a National Historic Landmark on 27 March 2006. MEMPHIS, Tenn. (AP) – The 23-room Georgian-style mansion where Elvis Presley doggedly guarded his privacy was opened to the public Monday, giving fans their first look at the trappings and treasures of the rock ’n’ roll king. Officials of Graceland Enterprises Inc. said 3,000 fans would complete the tour Monday, some from as far away as England, France and Australia. The honor of being the first to enter went to Lytan Wells of Kenner, La., a New Orleans suburb. Some fans – like Mrs. Wells – arrived several hours before the 9 a.m. opening to visit Presley’s gravesite. The grounds of the 14-acre estate were opened to the public shortly after Presley’s death nearly five years ago to allow fans free visits to his gravesite. The Meditation Garden where Presley, his parents and his paternal grandmother are buried is part of the tour. Fans gathered at a staging area across the street from the estate to wait for vans which ferried them to the door of the mansion for the tour inside. For visitors without advance tickets, there was a 15-minute wait to get one of the 1,000 tickets – $5 for adults and $3 for children – held back for daily sales. The souvenir shops reported a brisk business, with T-shirts and postcards being the hot sellers. 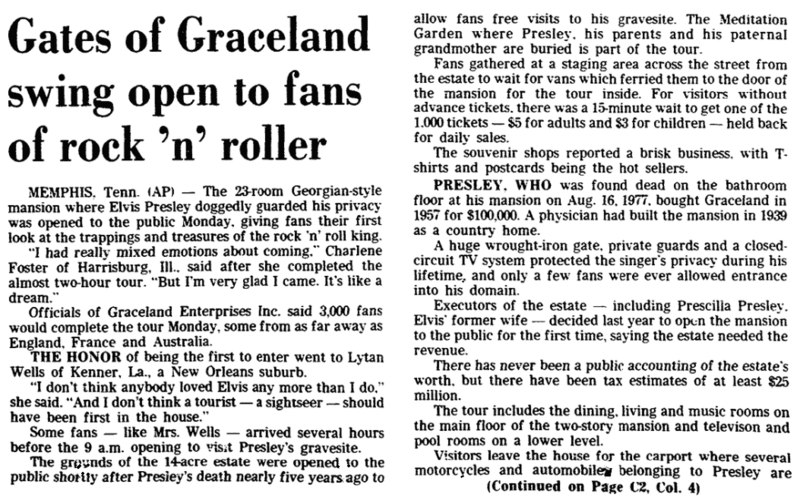 Presley, who was found dead on the bathroom floor at his mansion on Aug. 16, 1977, bought Graceland in 1957 for $100,000. A physician had built the mansion in 1939 as a country home. A huge wrought-iron gate, private guards and a closed-circuit TV system protected the singer’s privacy during his lifetime, and only a few fans were ever allowed entrance into his domain. Executors of the estate – including Priscilla Presley, Elvis’ former wife – decided last year to open the mansion to the public for the first time, saying the estate needed the revenue. There has never been a public accounting of the estate’s worth, but there have been tax estimates of at least $25 million. The tour includes the dining, living and music rooms on the main floor of the two-story mansion and television and pool rooms on a lower level. Visitors leave the house for the carport where several motorcycles and automobiles belonging to Presley are displayed. From there, visitors walk past the horse stables and toward the trophy room, where Presley’s gold record collection, awards, costumes, part of his gun collection and hundreds of other pieces of memorabilia are displayed. Nearly every aspect of Presley’s life is touched upon – his birth in Tupelo, Miss., his school days, his Army life, his marriage and the birth of his daughter, 14-year-old Lisa Marie, who will take over the mansion and the estate at her 25th birthday. Note: An online collection of newspapers, such as GenealogyBank’s Historical Newspaper Archives, is not only a great way to learn about the lives of your ancestors – the old newspaper articles also help you understand American history and the times your ancestors lived in, and the news they talked about and read in their local papers, including more recent events. Are you an Elvis Presley fan? Have you visited Graceland?